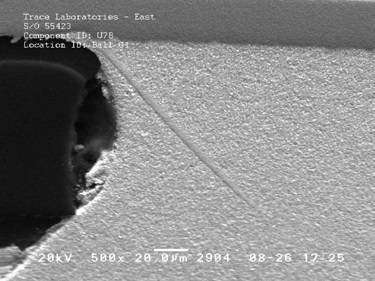 The use of Scanning Electron Microscopy / Energy Dispersive X-Ray Spectroscopy (SEM/EDS) in the analysis of failure related issues of printed circuit boards (PCBs), assemblies (PCAs), and electronic components (BGA, capacitors, resistors, inductors, connectors, diodes, oscillators, transformers, IC, etc.) is a well-established and accepted protocol. 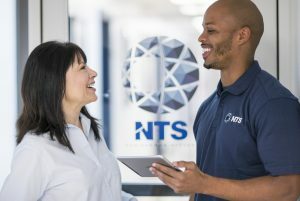 As opposed to or simply in addition to normal optical microscopy, SEM/EDS allows for the “inspection” of areas of interest in a much more informative way. 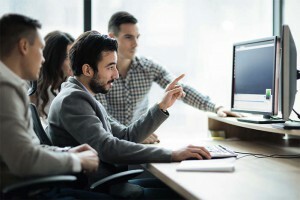 Scanning Electron Microscopy (SEM) allows for visual observation of an area of interest in a completely different way from that of the naked eye or even normal optical microscopy. SEM images show simple contrasts between organic-based and metallic-based materials and thus instantly provide a great deal of information about the area being inspected. At the same time, Energy Dispersive X-Ray Spectroscopy (EDS), sometimes referred to as EDAX or EDX, can be used to obtain semi-quantitative elemental results about very specific locations within the area of interest. Simply put, SEM allows an area of interest to be examined at extremely high magnifications. 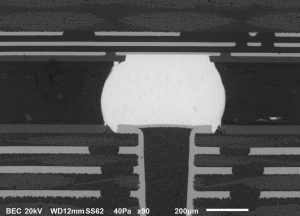 SEM produces images of high resolution and detailed depth of field unlike those attainable using normal optical microscopy. As examples, surface structures, general anomalies, and areas of contamination can be easily identified and then if needed, isolated for further analysis. A specimen containing the area(s) of interest is placed within the vacuum chamber located at the bottom of the SEM column. An electron source, located at the top of the column, produces electrons, which pass through the column and are incident upon the specimen. 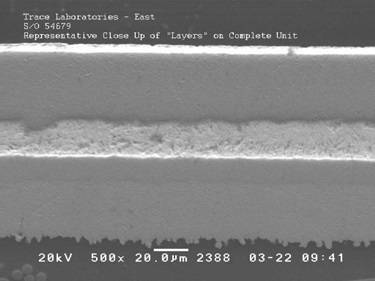 The electron beam is directed and focused by magnets and lens inside of the SEM column as it approaches the specimen. The beam “swings” across the sample causing some of the electrons to be reflected by the specimen and some to be absorbed. Specialized detectors receive these electrons and process the signal into a usable format. Typically, the three different detectors used are referred to as: Secondary Electron, Backscatter, and X- ray. 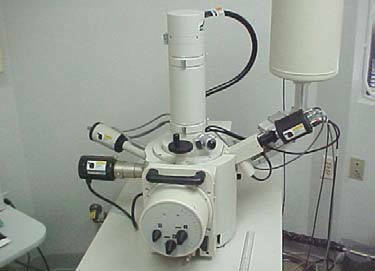 Secondary Electron – The secondary electron detector is primarily used to observe surface structure(s) associated with the specimen. This detector converts the electrons reflected by the specimen surface into a signal that can be displayed as an image on a monitor. Subsequently these images can be captured as a photograph, if desired. SEM images, as well as any “captured” photographs, are grayscale in appearance as opposed to color because the electrons being detected are actually beyond the light spectrum. will absorb more electrons than an element with a lower atomic number thus, for example, areas consisting of carbon (C) will appear much darker on the gray scale than an area containing lead (Pb). X-Ray – The term X-ray detector is a general term for the type of detector used to perform Energy Dispersive X-Ray Spectroscopy (EDS). The X-ray detector, or more specifically, the EDS technique is used to qualitatively and most of the time “semi-quantitatively” determine the elemental composition of an area of interest which was visually identified and observed using the secondary electron and backscatter detectors mentioned above. importantly, these x-rays emitted from the specimen give information as to the elemental composition of the area. As a result, the EDS technique can detect elements from carbon (C) to uranium (U) in quantities as low as 1.0 wt%. In combination with the SEM itself, the specific area of analysis for a given specimen of interest can be adjusted simply based on the magnification at which the specimen is being observed. Image 1, below, shows an overview of the SEM with the three detectors described above. Specifically, the SEM column and chamber can be observed in the center of the image with the secondary electron and backscatter detectors found attached to the left side of the chamber and the X-ray detector attached to the right side of the chamber. 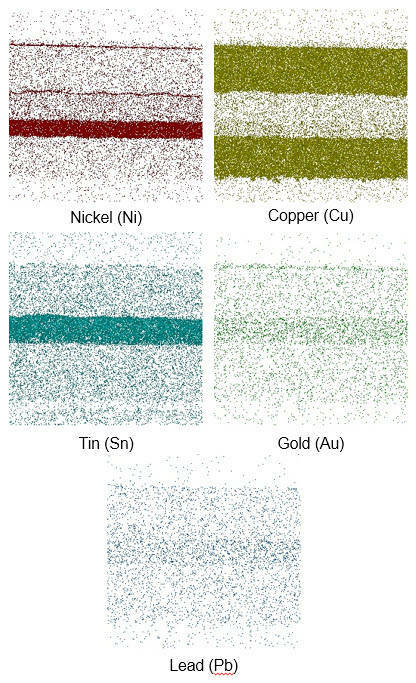 Based on the capabilities of SEM/EDS, many different types of samples can be easily analyzed. 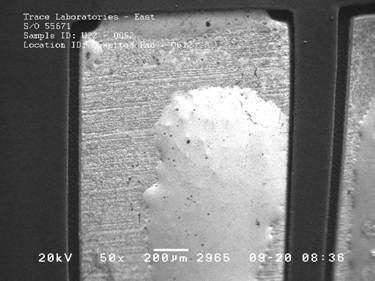 Everything from the visual inspection of a solder joint to the elemental analysis of an observed board surface residue, SEM/EDS obtains information that other analytical techniques simply cannot. Both SEM and EDS can be used for evaluating and / or analyzing samples whether it’s simply for screening purposes or for a failure related issue. 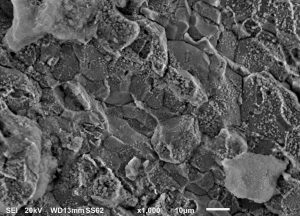 Typically, SEM provides the visual “answer” while EDS provides the elemental “answer”. In both cases, areas of interest can be observed aerially or in cross section. From a common screening aspect, solder joints are typically inspected for overall integrity reasons by observing grain structures, contact areas, IMC layers, etc. 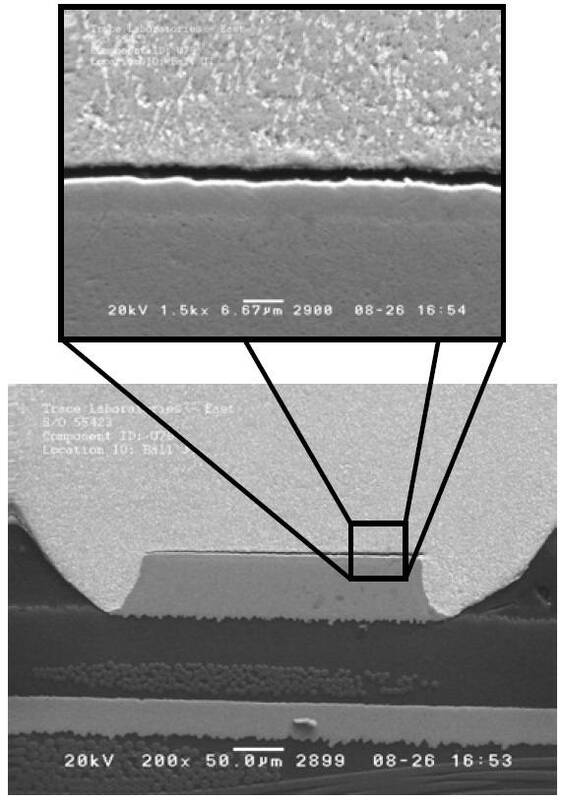 For failed samples, the same basic techniques are used but are more focused on solder joint voiding, solder joint / pad separations, or other failure related characteristics. As an example, the SEM/EDS technique can give invaluable information about exactly where a separation is occurring. Coinciding with any images obtained via SEM, EDS can be used to obtain elemental information about the area of interest. integrity of a solder joint or investigating a failure. Elemental maps can be obtained for each element of interest and use varying color intensities to visually show the concentrations of a specific element across the area being inspected. In the example below, elemental mapping was used on the solder joint of a connector sample to make sure that the elements present were in the “correct” location. Overall, SEM/EDS is an extremely effective tool in the analysis and inspection of solder joints and other related areas of reliability.